Today I thought I would share a ridiculously easy and inexpensive project. 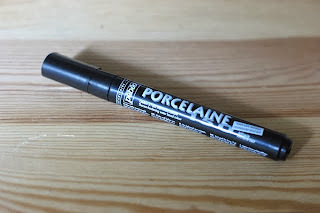 Porcelaine is a neat type of paint that adheres to ceramic. Best of all it comes in a pen dispenser so you can get fairly good accuracy. I bought mine at Michaels, I think the pen was around 7$ but I used a 40% off coupon. I purchased this lovely mug at my local goodwill for 2$. I took a before photo of the mug but I can't seem to find it. I loved the detailing on the handle. I was inspired by a few different Etsy pieces that I have seen. 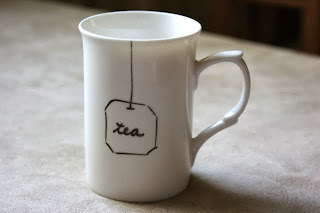 The design is basically a very simple little tea bag hanging down from the cup. I don't think mine is as professional looking but I am certainly no artist (I had to get the beau to help with some of the work). I wanted to start small as this was my first Porcelaine project. The process is really easy. The pen is a lot like a sharpie, you draw on what you want. Let dry for 24 hours then bake at 150* in your oven for 35 minutes. Then you are done! I think the instructions said it was dishwasher safe but I would still advise to hand wash and not scrub directly on the image to preserve it. 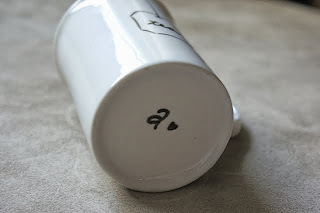 I know I will be keeping my eyes peeled when vintage shopping for more cute pieces of ceramic that I can experiment on. 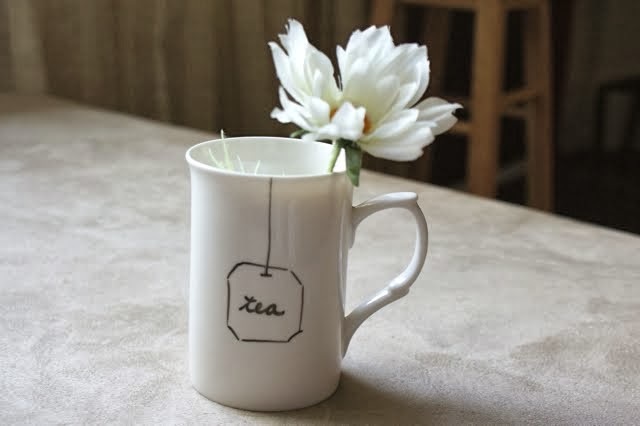 My gal pal at Reckless Bliss had showed me this beautiful mug from Anthropologie, I think making a copy cat might be my next Porcelaine project! Brag Monday at the Graphics Fairy. Thanks for stopping by your blog is lovely! I love your tea cup! Thanks for the information about the Porcelain pen. I haven't heard of that before but I'm going to have to go get one. 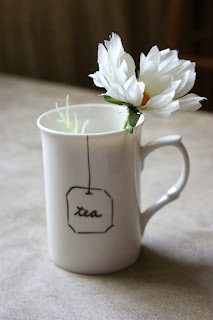 Looks like a very fun way to decorate old ceramics. I'm visiting from Graphics Fairy.